Astigmatism is a fairly common condition where the cornea, the transparent tissue layer at the front of the eye, is not as spherical as it should be. The cornea needs to be perfectly curved in order to focus light properly onto the retina (the light-reflecting part of the eye), in order for the eye to see images clearly. A flattened cornea will cause images to be blurry or distorted. In some cases, it is the lens that causes the problem, although this isn’t as common as corneal astigmatism. Most astigmatism patients were born with the condition, although no one knows exactly why. 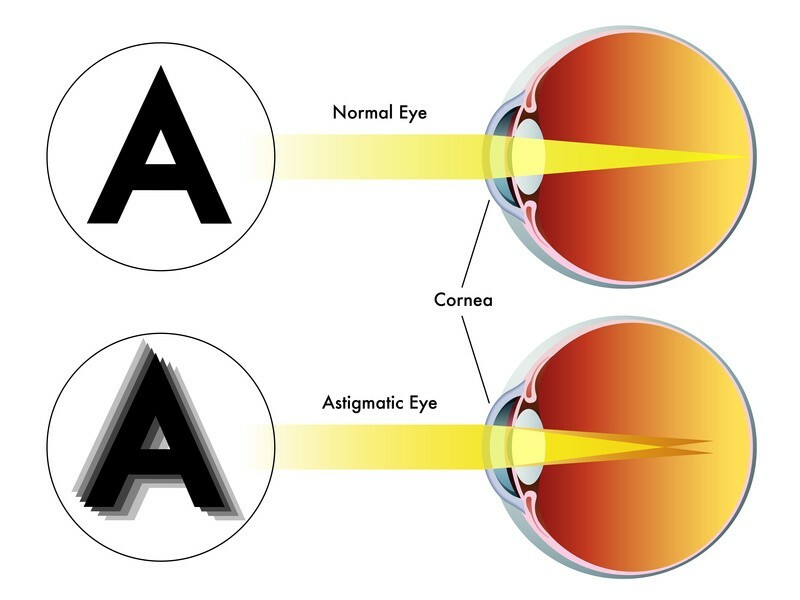 Astigmatism also tends to occur alongside other refractive problems such as longsightedness and shortsightedness. Twenty-five percent of astigmatism cases stem from a condition called keratoconus, a thinning of the cornea which causes it to bulge out, thus distorting vision. Patients with keratoconus tend to suffer moderate to severe degrees of astigmatism. Astigmatism can be detected in a routine eye test, which is why it’s very important for adults and children to have regular eye tests. Early diagnosis is important, especially for children, so they can be given corrective treatment. Can You Use Contact Lenses for Astigmatism? Astigmatism is measured in diopters. Patients with astigmatism greater than 1.0 diopter will require corrective glasses or contact lenses. If you need corrective eyewear, your optometrist will decide which option is best for you. Children 12 years or over are given the option to wear contact lenses. The most common types of lenses used to treat astigmatism are gas permeable lenses and soft lenses. Soft lenses are more comfortable to wear, and range from ones that are replaced daily to those that can be worn for a month before being replaced . In terms of effectivity, gas permeable ones are considered to be better at correcting astigmatism. Should You Have Laser Eye Surgery for Astigmatism? Laser eye surgery can be an effective permanent solution to astigmatism, especially for patients who do not want the inconvenience of wearing glasses or contact lenses. There are certain conditions that a patient must meet in order to be eligible for laser eye surgery. The main requirement is that the patient must be at least 21 years old and have had a stable prescription for at least one year. Patients who might not be suitable for laser eye surgery include those who are pregnant or breastfeeding or who are suffering from diabetes, autoimmune disorders such as HIV and AIDS and rheumatoid arthritis, or other eye conditions such as glaucoma and cataracts which need to be treated first. There are three main kinds of laser eye surgery – PRK (photorefractive keratectomy), LASEK (laser epithelial keratomileusis) and LASIK (laser-assisted in-situ keratomileusis). PRK and LASEK are ideal for people with thin corneas. LASIK, on the other hand, accounts for 95% of laser eye treatments, as it’s versatile and has a quick recovery period. Wavefront LASIK, otherwise known as custom LASIK, is a variation of LASIK that’s especially effective for correcting astigmatism. This treatment uses three-dimensional measurements of how the eye processes images in order to make accurate corrections on the cornea. Wavefront LASIK is ideal for patients suffering from moderate to high degrees of astigmatism. Still want more information in Astigmatism? Check out this NHS Astigmatism guide.